I’ve mentioned before about how the sync_binlog setting in MySQL can be especially slow on ext3. Of course, I wasn’t the first to discover this; the MySQL Performance Blog mentioned it months ago. I was reading through some of the slides I mentioned in my last post, and remembered that I’d left sync_binlog off on an in-house replicated slave. You’re able to set it on the fly, so a quick set global sync_binlog=1 was all it took to ensure we flushed everything to disk. A while later I blogged about dstat and thought to run it on the in-house MySQL slave. I was confused to notice that the CPU was about 50% idle, 50% “wai” (I/O wait). For a box that’s just replaying INSERTs from production, that’s really bad. 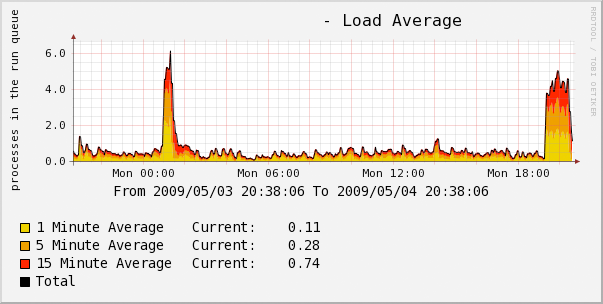 Below is a graph of load on the system. Care to guess when I enabled sync_binlog? Disk I/O does roughly the same thing, but it’s less pronounced, “only” doubling in volume. But the difference is still pretty insane! I think part of the thing I love about MySQL is the same thing I love about Firefox and Thunderbird. Even though I sometimes wonder if there are databases that would work better than MySQL or have fewer bugs, MySQL has an incredibly rich community that’s home to myriad fascinating projects. I’ve looked into MySQL Proxy at work a bit, and found it pretty interesting, but it’s still considered alpha-level code, and we don’t really need a proxy in front of our database right now. It turns out that MySQL Proxy has a competitor, Dormando’s Proxy for MySQL, better known as dpm. It’s a BSD-licensed proxy created by SixApart’s DBA. (SixApart used to own LiveJournal, which is well-known for releasing memcached to the community.) Given that I’ve worked with neither dpm nor MySQL Proxy, I’m not able to comment on the merits of either, but it’s a handy link to have. Drizzle is “a lightweight SQL database for [the] cloud and web,” which is forked from MySQL 6. (And for those of you scratching your heads: yes, I said version 6. Yes, 5.1 is the latest release branch.) There are some big names working on Drizzle, and besides “the cloud,” they talk a lot about “massive concurrency,” which is something that should be of interest even to people running more traditional databases. And, of course, there’s Percona’s XtraDB engine for MySQL, a significant overhaul to InnoDB. It seems a bit of a young technology for production environments, and yet it seems like it’s production environments where it would have the best impact. This is only tangentially related to MySQL, but I’ve seen Sphinx mentioned in at least three distinct places today, a SQL-based fulltext search index. I’d be curious in seeing how it compares with Lucene. The delete is commented out, so it will just list the files. Uncomment when you’re convinced it does what you want. Obviously, change the top two lines to suit your needs, and play around with find (for example, there’s an atime instead of my ctime). But it’s a handy little thing to have around and just adapt as needed. The output is a list of numbers from 0 to 99. For a fun example of when you might need this, consider the case of noticing that Postfix isn’t running on a machine and starting it. Your mail client promptly crashes, and the flurry of output in the log indicates that it’s delivering mail as fast as it can, but complaining that some mail has been in the queue for 180 days. “Holy smokes,” you exclaim, stopping Postfix. “Just how much mail is there?” You’re not entirely sure because you aborted your ls after it sat for a good minute with no output. That’s never good. du -sh shows about a gig and a half. “I’ve got this under control,” you think. rm -f /var/spool/postfix/*. Ta-da! Wait, what’s this “/bin/rm: Argument list too long” business? That error can’t possibly be good. rm very rarely complains. So we tried a smaller delete size, thinking we could do postfix/1*, postfix/2*, etc. Just step through it. That, too, was too much for rm. In our case, we ran into an obscure problem where we expected the combination of two fields to be unique. Without publicizing anything secret, we had a summary table of user_id and month. (Not that it’s actually anything secret, but I refer to the table I did this on as “tablename,” just since blogging about our production database schemas seems like a bad idea…) A brief bug introduced some duplicates. My task? Remove the duplicate rows. But how does that help? The problem with temporary tables is that they’re, uhh, temporary. If you lived on the edge, you could probably “DROP TABLE original_table; CREATE TABLE original_table (SELECT * FROM temp_table)”, but this has a few horrible problems. One is that you’re throwing away all your disk-based data so you can populate it with a version that exists only in RAM. If anything went wrong, you’d lose the data. Furthermore, in our case, this is a live, busy table. Dropping it in production is awful, and it would take many minutes to repopulate it since it’s a huge table. For bonus points, we’re selecting from the real table, so the silly CONCAT() field doesn’t come through into this temporary table. So once again, I momentarily flashed a sly grin. This is going to be easy! DELETE FROM tablename WHERE id IN(SELECT id FROM dupes);. But then my sly grin faded. It turns out that there are two problems here. The first is that there are still a lot of rows. In my case, I was doing an IN() with about 6,000 rows. MySQL doesn’t like that. But there’s a bigger problem. (Thanks to Andrew for confirming that this is a real bug: #9090.) MySQL doesn’t use indexes when you use a subquery like that. It seems the bug is pretty narrow in scope, but this is precisely it. So that query is awful, basically doing 6,000 full table scans. And on a really big table. So the solution comes from something I’ve never even thought about doing before. MySQL calls it the “multi-delete.” I call it the, “Holy smokes, this could go really, really wrong if I’m not careful” delete. That’s the command you want, but a few caveats. First, change the first line to “SELECT *” and run it to see what happens. Make sure it’s only grabbing the duplicate rows. You’re not able to use a LIMIT in a multidelete query, so you have to be extremely careful here. Second, we tested this multiple times on various test databases before doing it against our master database, and I was still uneasy when it came time to hit enter. Keep backups before you do this. And finally, in many cases, MySQL will expect an explicit “USE database_name” before the multi-delete, where database_name is the database housing the table you’re deleting from. Keep that in mind if you get an error that it can’t find the table, even if you explicitly reference it (via database_name.table_name). echo "Viewing crons for $i"
Silly MySQL trick of the day. This is probably no stranger to those work with MySQL all the time, but it’s a nice trick to have up your sleeve. For reasons I still can’t wrap my head around, one of the MySQL tables we need for Cacti just up and vanished. It’s not really used for anything essential, so it’s not a great loss, just really annoying. So I need to recreate it. Fortunately, I have MySQL running on another machine. Why write out the CREATE TABLE statement when we can just let MySQL tell us exactly how to re-create a table? I initially discovered this with the considerably more complex issue of views (SHOW CREATE VIEW), but it extends to tables, too. So now we can just copy-and-paste. Viola! Well not viola for me, but viola for anyone whose filesystem hasn’t gone corrupt. In case anyone else is struggling like I am… After you install MySQL on CentOS, it doesn’t seem to want to start… You run mysqld and it barfs up an error. It turns out that it’s because you need to run service mysqld start instead.